Do you know of Elijah, prophet of God, who challenged 950 idol worshipers to a contest to see whose God was best? With thousands of spectators watching, the competition of gods felt like a championship football game or soccer match. Whose god was the real God? They all wanted to know. Each team laid a sacrifice on a wooden altar. But neither team was allowed to set fire to their sacrifice. The agreed upon rules stated each side had to cry out to their respective god to provide the flames. Elijah, the one-man team, convincingly conquered the powerless opposition when God dramatically answered his prayer. Sending fire from the sky, God’s power burned up the ox offering, the wood altar, and 12 stones stacked beneath. God’s fire even “licked up the water that was in the trench” around the altar. The audience who saw even stones and water consumed in flames responded by falling on their faces and saying, “The Lord, He is God…” (1 Kings 18:39). No doubt Elijah felt an adrenaline rush! He was ecstatic for the vindication of God’s name and emboldened to believe God for more. It’s easy to feel that way when you’re certain something you see is from God. But Elijah was also still very human. Just a few verses later, Queen Jezebel sent a courier with a threat on Elijah’s life. “He was afraid, arose, ran for his life…” (1 Kings 19:3) and hid in a cave. But God knew where Elijah was hiding. The word of the Lord came to Elijah and told him to go stand outside the cave. A great strong wind came that dashed rocks in pieces “…but the Lord was not in the wind.” After the wind, an earthquake came “…but the Lord was not in the earthquake.” Then a fire “…but the Lord was not in the fire.” After the fire, came the sound of a low whisper. Elijah sensed that God was present in the soft whispers. He covered his face in humility and listened as God spoke. (See 1 Kings 19:11-13.) This is the lesson for you and me today on how to recognize the voice of the Spirit. 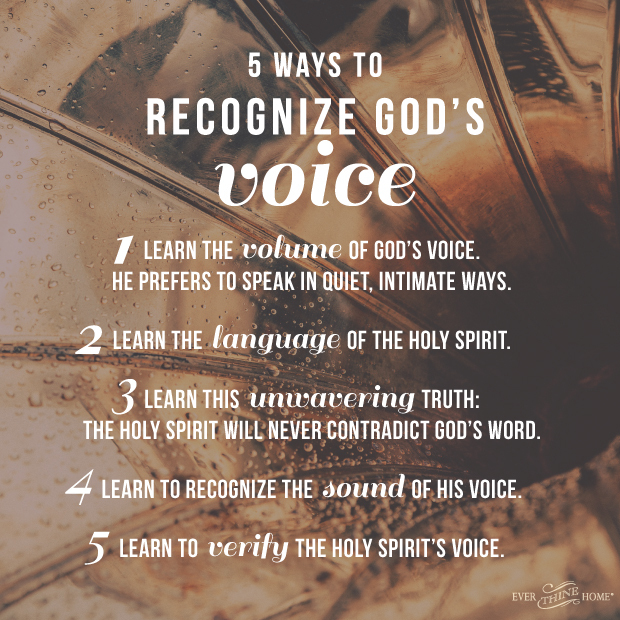 Here are five ways to recognize God’s voice. 1.Learn the volume of God’s voice. He prefers to speak in quiet, intimate ways. Though God can use nature in spectacularly loud ways, like He did with Elijah, I’ve never found a single instance in the Bible when God screamed, yelled, or shouted at His people. Over 1000 years after Elijah another violent wind was sent to teach. The wind churned the sea into huge, frothy waves, and crashed them into the small boat threatening to capsize it. Howling, splashing sounds punctuated by exploding lightning and thunder had filled the exhausted disciples’ ears all night. They were hoarse from yelling to one another to be heard above the roar. It was almost morning, but the worst was not over. As early dawn illumined the wave crests, they saw a ghost out on the sea. They were terrified. 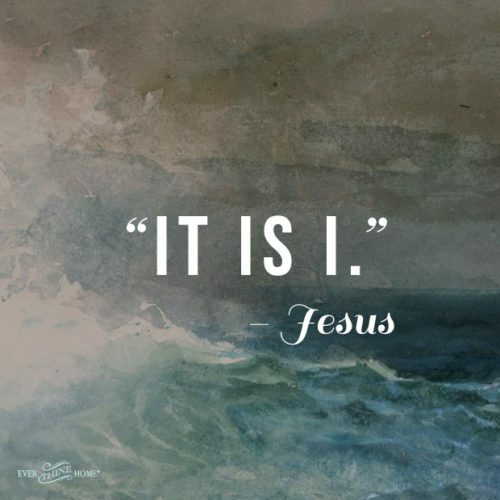 Calming their fear amid the screaming cacophony came a simple, calm, “It is I.” Jesus’ soft declaration turned away the wrath of the wind and waves. (Proverbs 15:1, John 6, Mark 6). What a beautiful image of the tender power of God toward His children. Jesus did not rebuke His frightened, weary, and beloved friends. He didn’t reprimand or chastise them. Instead, each of His friends heard His calming voice as clearly as if He’d spoken to them face to face. How many times did I yell to be heard above my children’s loud noises! Not Jesus. As Lord over all, His words, His voice, have more power than the strength of nature’s violent winds. Even His whispers declare authority. A good reminder for us that raising our voices is not necessary to communicate authority with squabbling children. “Not by might, or by power, but by My Spirit says the Lord…” (Zechariah 4:6). 2. Learn the language of the Holy Spirit. I only speak one language: English. Many around the world are bilingual or multilingual. Imagine the multiplicity of languages God speaks—He thought of every dialect of every language from every civilization and tribe who ever populated this earth! Yet His eternal words containing the secrets to knowing, pleasing, and living rightly before God has never changed since time began. The Bible is the Spirit-inspired vocabulary God uses to speak to us. “All Scripture is inspired by God…” (2 Timothy 3:16) and written by “men [who] spoke from God as they were carried along by the Holy Spirit” (2 Peter 1:21). Become fluent in His Word and you will more easily recognize His Spirit’s voice. Remember, learning a new language takes time. Ask your Helper to be your translator as you continue growing in fluency. 3. Learn this unwavering truth: the Holy Spirit will never contradict God’s Word. In the moment, I noted the good reminder. But upon later reflection, I realized it was more than factual. The Holy Spirit shined His light on those six words, making it clear that those were His inspired words to me personally. The realignment of my anxious heart with the truth of God’s control and purposes, which I don’t always see, was clearly the whisper of the Holy Spirit. I can be sure of that because He will never guide me to do or believe something contrary to God’s written word. Reminding us what is true about God Himself is always needed. A good starting place to measure what we hear is the Ten Commandments. Any suggestion by another person, or any thought in your own mind, about cheating, stealing, lying, jealousy, adultery, or harming someone else is clearly not from the Spirit. Having the thought, I could pick up that cute little bookmark and drop it in my purse. No one would know, is not the Holy Spirit’s idea. The idea itself is not a sin or disobedience. Taking the bookmark, though, is stealing and not following the Holy Spirit’s guidance clearly lined out in God’s Word. 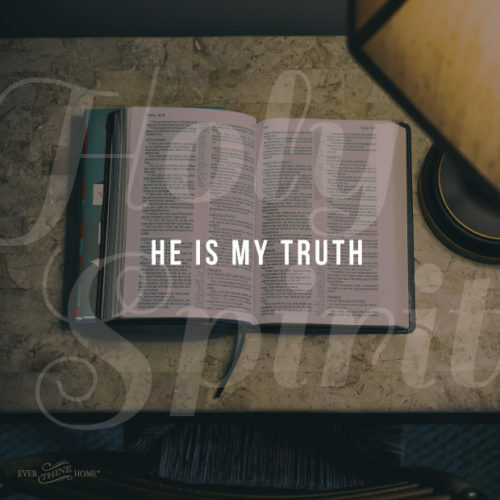 The Holy Spirit’s whispered words will always match the unchanging truth of God’s Word. 4. Learn to recognize the sound of His voice. It’s unflattering to learn that God likens us to sheep who are quite gullible, defenseless, and susceptible to disease and injury. Jesus knows our every weakness. In His great love and kindness, He teaches us to stay close to Him for our safety and protection. “I am the good Shepherd…I came that they might have life and have it abundantly” (John 10:10-11). There is a very real thief who knows our weaknesses and who intends to steal, kill, and destroy the sheep Jesus came to save. The safety Jesus longs to give us is found in following His voice: “My sheep hear My voice and I know them, and they follow Me” (John 10:27). Darlene studied God’s Word all her life and knew it well. She was used to hearing God’s voice. Therefore, she easily recognized it. Tune your ear to recognize the sound of His voice. Recognizing the sound of someone’s voice only comes with regular time together and conversation. Ask the Helper to sharpen your hearing, so you recognize His voice and His words more clearly. 5. Learn to verify the Holy Spirit’s voice. How do you know if the voice you’re hearing is yours, someone else’s, or the Holy Spirit’s? Ready for some heavy-duty theology? I’m confident we women can learn this because we have the promised Holy Spirit dwelling within us Who guides us into all truth. Agree? Jesus told us the devil is the Father of Lies. So every suggestion, every single word, from him will be contrary to God. Anything from his voice is obviously wrong, even if it might feel comfortable, inviting, or convenient. The world we live is not yet subject to the King of kings. God, in His mercy, allows people to live in disobedience to His authority and from these millions of people on earth come voices: opinions on how to live, what choices to make, and how to be happy. God’s Spirit longs to give us discernment as to which words are true, which are partial truths, and which are falsehoods. Other messages come from the flesh. The flesh is the invisibly broken soul, “the law of sin” that dwells within (Romans 7:22). Every human inherited this from Adam and Eve when they rebelled against God. But there’s hope! Paul, the apostle, teaches us how to live set free from the always-with-us desire to sin. He explained, “Walk by the Spirit and you will not carry out the desires of the flesh. For the flesh sets its desire against the Spirit and the Spirit against the flesh” (Galatians 5:16-18). The Spirit-flesh dichotomy, our heavy-duty theology for the day, is the essence of our question. Is your first instinct to defend yourself or prove you’re right? If so, that is your flesh. It is not the Holy Spirit. Are you looking down on someone or feeling disdain for another person? If yes, that is your flesh, your sinful nature at work. The Holy Spirit is always love and wants to give you love for every person. Are you envious of what someone else has, feeling you deserve the same thing? If so, that is your flesh. The Holy Spirit never leads us to or condones jealousy. Are you struggling to apologize and admit you’re wrong? That too is your flesh. The Spirit’s desire is for your pride to decrease and the humility of Christ to grow in its place. Do you see the toddler version of yourself coming alive? Do you want what you want, when you want it? That’s walking in the flesh, not the Spirit. The Holy Spirit desires sacrifice for God that is also God-dependent, not sacrifice for self-glory. Are you ungrateful and discontent? If so, you’re being led by your flesh. Ingratitude is never from the Holy Spirit. So how’d you rank? It’s okay if you’re not where you’d like to be yet. You cannot get there on your own. You’re learning and growing in the Holy Spirit as you read this summer study. The Holy Spirit is the greatest gift to believers! We cannot live the Christian life as God intends on our own strength. Sure, we can pretend, create a nice exterior and even deceive ourselves that we’ve got it under control. But the next disagreement with our husband or angry outburst at our kids reminds us of the truth: I need Thee O I need Thee. Every hour I need Thee. When I make these mistakes and others, which I do daily, I acknowledge them and give thanks to God for my salvation in Jesus. “If we confess our sins He is faithful and just to forgive us our sins and cleanse us from all unrighteousness” (I John 1:9). Though I am still prone to feelings of failure and discouragementbecause of my inadequacy, I am learning to be quick to remember, “There is therefore now no condemnation for those who are in Christ Jesus…the Spirit of life in Christ Jesus has set you free…the mind set on the Spirit is life and peace” (Romans 8:1-2, 6). I have this verse framed and prominently placed in my kitchen. Just yesterday, I walked over to read it again, thanking the Spirit for His reminder of what God has spoken about me. Now that you know how to hear His voice, what do you do with what you hear from the Holy Spirit? Recently, I had a light-bulb-moment. The Holy Spirit showed me that I tend to hear most good ideas, assume they are all from Him, and then assume personal responsibility for making the idea or action happen. Usually too I think I have to act now because He spoke. Remember the story of Jesus telling His brothers He wasn’t going to the feast? That always puzzled me because two verses later Jesus went to the feast secretly. Why did He say no, then go? The key is found in these words: “My time is not yet at hand” (John 7:6). I am learning to live as His servant. “As the eyes of servants look to the hand of their masters, so our eyes look to the Lord our God”(Psalm 123:2). To sum it all up, here is God’s will, the Spirit’s greatest desire for each one of us. “Do not be conformed to this world, but be transformed by the renewing of your mind (which is the Holy Spirit’s work in us), that you may prove what the will of God is, that which is good and acceptable and perfect” (Romans 12:2). Share a time when you heard the whisper of the Holy Spirit, did what He said, saw Him work, and you knew it was the will of God. What Does It Mean to Pray with Faith?